Kitchen! Kitchen! 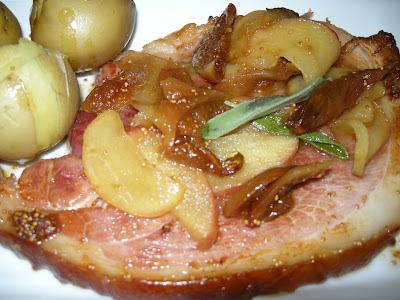 : ham, apples, and figs....at kitchen! kitchen! It's not green eggs, and ham, but apples, figs, and ham! to go with it!!! Dr. Seuss will be so envious. Baked ham slathered with sauteed apples and figs sweetened with honey. A perfect rhyme for your table! I seem to be gearing up for fall, with all this comfort food that I seem to craved. Apple picking is just around the corner, if you think about it. Although I still want to hang on to summer, I do longed for fall. This longing is sometimes reflected on what I prepare. Like my apples, figs and ham. It is quite easy. 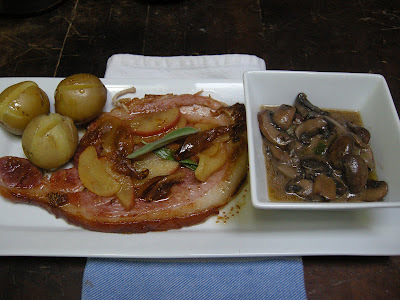 Have your deli or butcher sliced an inch thick of ham and follow the instructions on my previous posting of smoked pork chop. 1-2 tablespoons of flour (for thickening)-Add the flour to the sour cream with 1/2 cup water and mix until smooth (set aside). Sautee the shallots until soft; season with a pinch of salt; add the mushrooms and stir for about 5 minutes until cooked; add the sour cream/flour mixture and stir thoroughly until well mixed. Cook for another 2-3 minutes until the sauce thickens. Melt the butter in a large pan, add the apples, lemon juice, figs, and the rest of the ingredients except for the honey until the apples and the figs start to carmelized; then add the drippings from the ham; add the honey and continue cooking on medium low for another minute or so. Add the sage leaves just before you shut off the flame. Drizzle over the ham.